A couple days back I posted a photo of methi laddoos, a delicious winter variety of nutty ladoos on my Facebook feed. Everyone kept asking for the recipe, so here it is. Straight from my mami, who lovingly sent a box with my cousin who came over. All winters we have literally hogged on these laddoos since childhood. But because of the very intense ingredients used, the quantity was limited to only one laddoo per day. May be a second one if you coaxed someone enough and drank a full glass of milk with it. I always did. These laddoos stay well at room temperature even for a month. During my internship days when I used to go to Delhi for a month in December, my mom used to make and give me 30-40 of these laddoos. And they used to be my breakfast every morning. Wholesome, compact and nutritious. Methi (fenugreek) is also a galactagogue, that is it enhances milk production in lactation mothers. They were my quick snack everyday when baby Arjun was born and I was feeding him. Caveat : Methi laddoos are I think an acquired taste. I love the bitter, nutty, sweet deliciousness but not everyone can handle it. If you are trying it for the first time, you can reduce the quantity of methi powder and gradually add in more if you find it suitable! Grate the dry coconut. Roast it on low flame in a thick bottomed pan till it turns golden brown. Remove on a plate and keep aside till it slightly cools. Roast the poppy seeds. Once cool, grind them along with some sugar. Poppy seeds release oil and become sticky, so we use sugar along with the roasted poppy seeds to grind. Grind all the dry fruits too. And the powdered dry dates to the dry-fruits. You can get powdered dates if you know a reliable source or shop. I make the powder at home. Now the roasted grated coconut can be crushed by hand itself. After you break the grated coconut into finer particles evenly, add all the above powdered material to this coconut along with the fenugreek powder. I get fenugreek seeds ground from the flour mill because I make a lot of laddoos in winter. But you can grind the seeds at home for the recipe as you need. If you roast the seeds just a light brown the bitter taste will lessen. Warm the container of pure ghee in a vessel containing hot water so that it turns liquid. Add this liquid ghee to this mixture. Don’t put the ghee to direct flame. Then roll the laddoos with your hand. Add a little more melted ghee if required for it to come together. Nice tasty laddoos ready to eat. There! Let me know how it turns out of you do make them. For the Daring Kitchen challenge in September, I made a trio of modak. One of them is this fried modak with a desiccated coconut filling. It is delicious and can be stored for upto a week in an air tight container. To make the filling, pulse dessicated coconut in a mixer till it breaks into crumbs. Dry roast it in a pan till slightly browned. Take it off heat and add the dry fruit powder, cardamom powder, milk powder and put it back in the vessel over heat. Add 5 tablespoons of condensed milk to it. Let it cook for 2-3 minutes till it becomes slightly dry. Take care to see that it doesn’t stick to the bottom. If it feels sticky, add another tablespoon of milk powder. Let the mixture cool down completely before using. In another bowl, take one heaped cup all purpose flour, and add ¼ cup water with ½ teaspoon salt. In a small wok, heat 2 and half tablespoon oil. Once hot, add 1 tablespoon of rice flour and let it sizzle for a few seconds. Add this oil to the bowl with flour and mix it well. Knead it for 2 minutes. And then keep it aside for 30 minutes to soften. After that, pulse it in a food processor for a minute, take it out and knead with hands to bring it together to form a smooth dough. Divide the dough into 12 equal balls. Roll each ball into a disk and then take it into the palm of your hand. Stuff it with some mixture leaving ½ inch on all sides. Start pinching the corners into petals with the use of your index finger and thumb and middle finger on each side. Make several such petals all around the edge of the disk. Then start getting all the petals together by pressing it closer with your fingers. Seal the top and keep it covered with a damp towel till all are done. In a big wok, heat 2 cups of vegetable oil. Fry two modaks at a time. Insert it into the oil pointed side down so that once that side cooks a little bit, it won’t open up while the rest of the modak are fried. Drain it on kitchen paper and serve. It was the first time my parents were going to meet my boyfriend and his parents. Coming from a mildly conservative family, it was a difficult task convincing my dad (an ex-cop) that I have taken the right decision and that he should meet Akshay and that he would love him. I was quite nervous that day. We had been going out for some time and while my mom was in on the secret, we had announced it to my dad just a couple of days ago. In India, where parents arranging a suitable groom for their daughter is still a norm, my daddy dearest was a bit shocked to say the least. All of us at my mom’s house ; in-fact our entire clan is very fond of sweets. And I am not exaggerating when I say we used to have a dessert at every single meal. 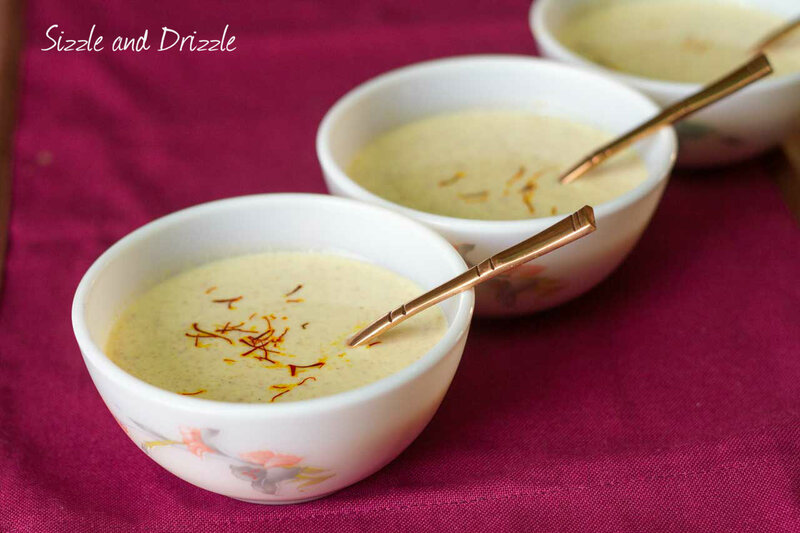 So when my family came to Akshay’s house that day, my would-be-mom-in-law served us this delicious kheer. We were bowled over by it, especially since it was sweet in a different way. My generally reserved and shy dad couldn’t help but have two servings of the dry-fruit kheer. It did set a wonderful pace for things to come, and my mom and dad both immensely loved Akshay and his family. We got engaged in two months and the wedding was another two months later. As I said, the culinary highlight of the evening was this shahi dry-fruit kheer, which has become a house favourite , and we must have made it atleast 20 times in the last two years. The best part is that it has very less sugar, and all the sweetness comes from the dried date powder. The chopped dry fruits and the rice granules make it a wholesome meal on its own. Soak the rice in 2 cups of water for half an hour. Then spread it on a towel to let it dry completely. Then in a big skillet/ vessel, heat 1 tbsp ghee and roast the ground rice grains, for 3-4 minutes till very slightly brown. Pour the milk over the roasted rice grains and let it come to a boil. Continue boiling for another 10 minutes, stirring frequently , till milk begins to thicken. Stir in the sugar , powdered dried dates, raisins and saffron. Mix well. Once the sugar dissolves, take it off the heat. This will take about 5 minutes at medium heat. Add the cardamom and nutmeg powder and mix till fully incorporated. Serve cold and garnish with a few strands of saffron. My father in law likes to stir in a few drops of bitter almond extract. Sprinkle some almond flakes, for an extra nutty flavor.